There are red demon and blue demon outside the window. However, their faces are flat like a tow mask. 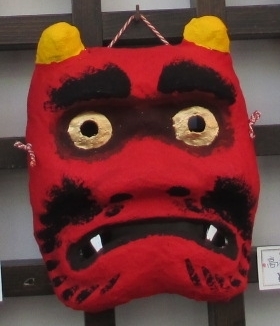 because they heard Setsubun campaign at a nearby supermarket. red demon is scary, blue demon is not scary. It may be a reaction of a famous fairy tale. As they ask. "Are you okay?" I look forward and reply. "It's okay." Then the demons started to move. I try to hide in the closet. But the mattress turned into a wall and stood in front of me. I hope to leave the world of dreams.